New Elvis Exhibition In Germany - Misc. Elvis is back in Germany. 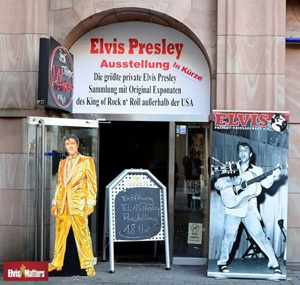 On November 18th the 'Elvis Museum' opens its doors in the city of Dusseldorf. Over 1500 items will be on display with a special focus on his military years 1958-1960. Tickets are 4 euro for children, 8,50 euro for grown ups. Here's the address: Elvis Presley Ausstellung Düsseldorf, Flingerstraße 11, 40213 Düsseldorf.